After reaching a partial agreement on land reform, the Colombian government and Revolutionary Armed Forces of Colombia (FARC) representatives in Havana have jumped to the second point of the Agenda for the End of the Conflict: political participation. As one might expect, the topic has sparked a verbose and polarized debate. How can the FARC be incorporated into civil society? Who of the FARC leadership should be accepted in a government building, and who should be judged in a courtroom? Throughout all of this, a bloody chapter of Colombia’s history looms large, silently reminding everyone that the most difficult aspect is not bringing guerillas into government, but rather, making sure the former enemies (from both sides of the conflict) do not continue the battle from the inside. After all, there is precedent for all of this. The 1980s peace negotiations between the Belisario Betancur government (1982-1986) and the FARC gave birth to the Patriotic Union (UP)—a left-wing alternative to the traditional power structure, intended to be the political vehicle of the FARC; a vehicle that would drive the conflict away from the battlefield. That never happened, and few members of the UP survived to explain why not. The new party was initially successful in the 1986 and 1988 elections. From the Communist Party to students to the generally disaffected, the UP received immediate and significant support. That is when the killing started. Shortly after the electoral victories, members and sympathizers of the UP started to be harassed by right-wing paramilitaries linked to the armed forces. One by one, the assassinations continued until more than 3,500 had died, including two presidential candidates. Many others fled their homes in terror. The killings blatantly violated initial accords that had paved the way for the UP, as the Colombian government had promised to assure the requisite safety to allow the party to function. Underscoring this obvious failure, the Inter-American Commission on Human Rights found admissible an allegation presented against Colombia for political genocide against the UP party in 1997. In spite of the wave of violence, a degree of public support continued. Colombians elected three UP congressmen and one senator in the 1991 legislative elections. But this humble victory could not mask the party’s death march towards extinction. In 2002, the UP failed to win sufficient votes to continue on ballots, and it dissolved as a political party, remaining only as a persuasive argument for guerrillas to refuse to give up their guns. Earlier this month, however, in a move intended to resonate in Havana, the Council of State restored the UP’s legal status, acknowledging that UP’s failure was due to systematic persecution and the assassination of its members. The decision of the court not only recognizes the slaughter that UP members suffered, but it also encourages the reactivation of the political movement. Can the UP be resurrected? 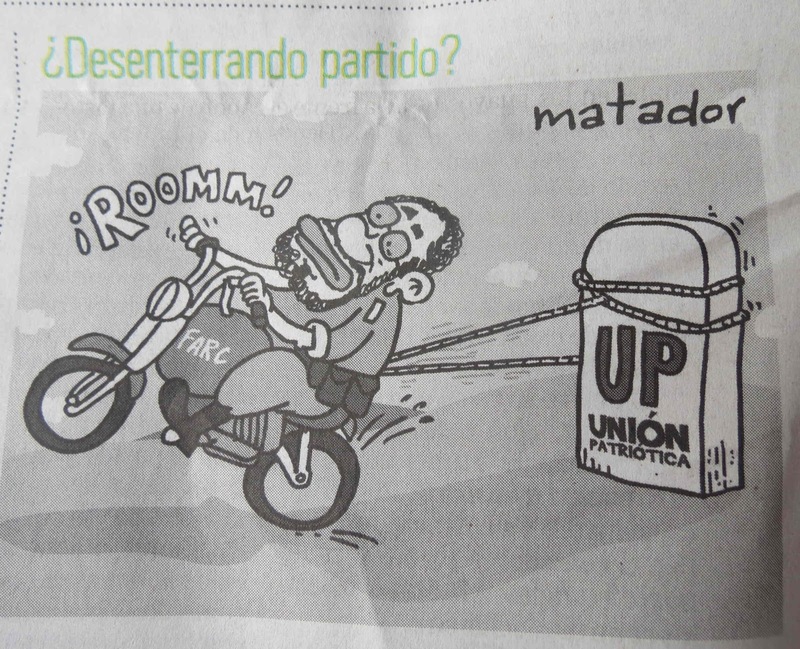 Nevertheless, the UP denies (at least for now) that it would serve as the political platform for the FARC. The president of the party, Omel Calderón, views this moment as an opportunity to consolidate a coalition of leftist parties, but the UP might well end up competing with the FARC, who have their own organizations poised to participate in politics if an agreement in Havana is struck (at least according to Calderón). The FARC acknowledge the rejection they provoke from Colombian society. They need to talk convergence, because without it they have no political future. Thus, convergence between the UP and the FARC seems natural—except, that is, to themselves. The recently reborn UP is reluctant to assume the heavy political baggage of the FARC. As for the FARC, they may prefer their own search for a new face without the scars of yesterday’s political failure. What happened to the UP was the result of an unhealthy union between violence and politics. Refusing to lay down their weapons, the FARC sacrificed the UP. Nonetheless, the annihilation of an entire generation that sought to fight in the congress rather than in the Colombian countryside cannot be explained away that simply. In the end, the biggest loser has been Colombian democracy. 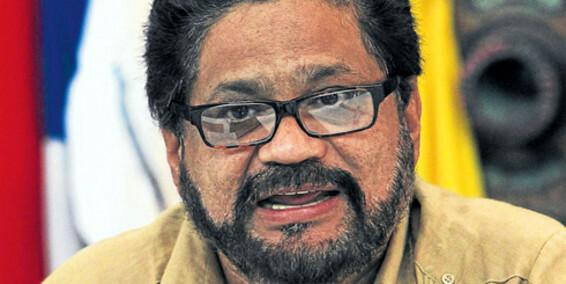 FARC leader Ivan Marquez. How will his army influence Colombian politics? Natalia Lozano trained in the Colombian Ministry of Foreign Affairs and writes for CON-TEXTO TADEISTA in Bogotá. She currently lives in Bogotá, Colombia. This entry was posted in Andean Region and tagged colombia peace process, Colombia union patriotica, Farc & UP, FARC Peace, FARC political party. Bookmark the permalink.